newprotest.org: GOODBYE TO THE CLUBSIDE? One of my favorite Olympia landmarks might be going away. This is the genuine item! A well appointed 'American Diner Style' restaurant in the heart of the State Capital with lots of pedestrian traffic. This restaurant serves food in generous portions: from hefty burgers to Philly Cheese Steaks. And everything in between! All the furniture on the premises is new. 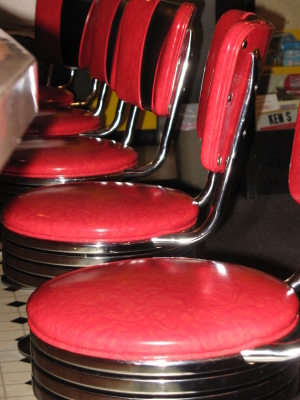 Yet the look is that of an authentic 1950's 'diner', This place is loaded with good feelings and lots of yesteryear charm. Yet the kitchen areas are modern and spotlessly clean! After 3 years of operation, gross annual sales have reached $500,000 and are still climbing. 'Take Out' and 'Delivery of hot food lunches'(to the thousands of state government employees in the City) now comprise an increasing portion of sales. This is the only restaurant of its type in the downtown area which is fully dedicated to what American hamburger 'joints' used to look and feel like, even down to the rotating vinyl counter stools. Offered for sale at $175,000. Seller possibly willing to carry a note for a serious party with a down payment of $50K. For additional details, call (360) 532-6800. I called Kenny (the owner), and chatted with him for a few minutes. It turns out that he and his wife felt that the business forced them to spend too much time away from their two kids at home, and so they are exploring some more options. They like working the place, but they want to spend more time with their family. I asked him why he wouldn't just hire on a manager to run the place, and he said that he tried that in the past when one of his sons was born, but he had a bad experience with it; it didn't quite work out the way he had hoped. He's not dead set on selling it at this point; he's just trying to see what kind of offers he can get for it, and to see what kind of opportunities it opens up for him. My wife and I took our family to the Clubside for dinner tonight and ordered their Philly cheese steak, topped with sweet peppers, grilled onions, and cheese whiz. Such great food. Seriously. You can't beat it. And because I'm such a huge fan of the diner, I'm trying to talk a friend of mine into buy it. It's a longshot, but we'll see what happens. Who knows? I wouldn't mine co-owning the place, either. COMMENTS for GOODBYE TO THE CLUBSIDE? Read what I said about this on MySpace. The food was a thousand times better when they first re-opened about two years ago. In summation: Yea Ubuntu! Boo Clubside! I was just there last night. I thought the food was fantastic.